Mr & Mrs L first approached R A Brown Heating Services during the planning stage. We proposed a few solutions and also suggested that the customers visit one of our other customers who had a similar project that was nearly complete, this would enable them to understand the solutions we can offer and discuss our performance, input etc. 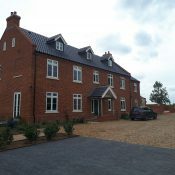 The new house was built to a high specification with 6 bedrooms and 5 bathrooms and a total of 585m2 of living space. 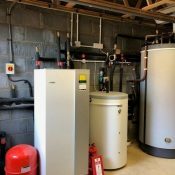 The customer was looking for maximum efficiency, there was no gas available at the property and due to planning regulations there was no option for the customer to consider an oil heating system. Therefore a renewable system had to be installed to meet SAP regulations. 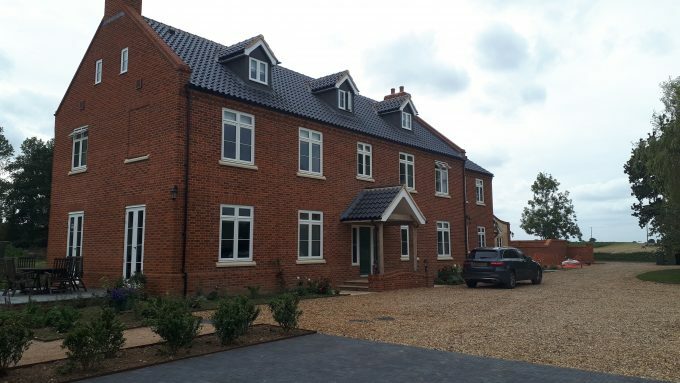 We completed the design and installation of a ground source heat pump system, underfloor heating and MVHR units, along with domestic pipework. 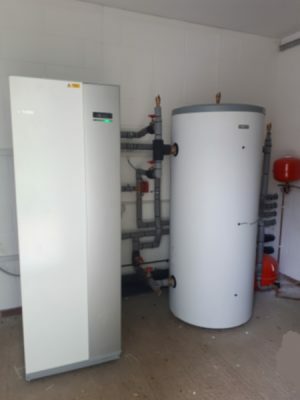 The installation comprised of 1 x NIBE 24kW 1345 twin compressor ground source heat pump installed with a NIBE 300/450 unvented cylinder with secondary return. Bore hole calculations were completed and 6 bore holes totalling 1,200m of active bore which are all linked back to a manifold to allow individual flow rates to be set. Underfloor heating pipework of 2180 meters laid to the ground and 1st floors with radiators to the 2nd floor. The MVHR system was designed and air flow calculations completed, the installation comprised of 2 x Zehnder units (1 x Q600 & 1 x Q450) The system supplies fresh air and extracts stale air at 132 litres per second through 407 meters of ductwork. The final Seasonal coefficient of performance (SCOP) achieved was 4.26. Seasonal efficiency gives an indication on how efficient a heat pump operates over an entire cooling or heating season. 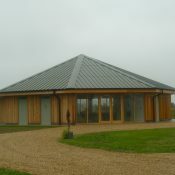 The customer has said “R A Brown were approached in the early stages of our project. They seemed to offer sensible advice and offered for us to visit another similar project that was being built, this helped us understand the installation process. I took my builder along to also understand as he had not been involved in such a complex system. Once we had an understanding of what was being proposed, we searched for other local companies that could offer what R A Brown could. 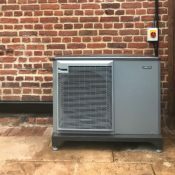 We wanted a ground source heat pump, underfloor heating and a mechanical heat ventilation recovery system, in addition for someone who could offer assistance with plumbing. R A Brown offerings met all these and trying to find someone else proved difficult, in fact impossible. Most others offered parts of what was needed, we wanted responsibility to be with one company. R A Brown offered and provided all that was needed and we are very pleased with the finished house and installation. I did not fully understand the complexity of the job, until I had to make decisions as to where I wanted things. I was asked for a lighting plan to enable the MVHR ducts to look right in the room and bathroom layouts to be confirmed before the room was built. Getting pipes through the house was complex but made to look easy.